Rarely do musicians appear who are gifted with both incredible technical ability and extraordinary vision. Guitarist/composer Ben Monder is such a musician and has been astounding listeners for years with his singular approach to the guitar and composition, an incomparable blend of the visceral and atmospheric. His first solo recording in eight years – Hydra – provides an astounding example of the expanse of his artistry. Seemingly under the radar, Monder has been busy as an integral part of New York City jazz and improvised music scene for over two decades. His instantly recognizable tone has shimmered and sparked along with the music of the Maria Schneider Orchestra, Guillermo Klein y Los Guachos, Paul Motian’s Electric Be-Bop Band and Bill McHenry’s ensembles, along with many others, perhaps most notably his longtime collaboration with genre-bending vocalist Theo Bleckmann. As a solo artist and composer, Monder has paced himself, meticulously crafting his pieces until he feels they are ready to present. Obviously, the time spent benefits the listener, as the compositions are truly inspiring. Most of Monder’s compositions begin as abstract ideas, which are used as starting points for experimentation until he finds the most interesting possibilities to construct a coherent and fascinating whole. 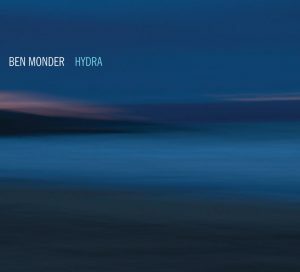 Monder’s compositions on Hydra are lovingly performed by an amazing group of collaborators, including vocalists Bleckmann, Gian Slater and Martha Cluver, bassists John Patitucci and Skuli Sverrisson, and drummer Ted Poor. Monder has featured Bleckmann’s voice in his compositions for years and, to add another dimension and timbre to the chorale sections of his compositions, he features the voices of Slater and Cluver. The recording begins peacefully with lyre-like arpeggios and Gian Slater’s heavenly voice on “Elysium.” The epic “Hydra” is an intricate yet ever expanding musical narrative with Monder’s extraordinarily fluid then jagged guitar playing and Bleckmann’s ethereal vocals highlighted throughout. The lovely “Aplysia” is subtle with moderate tempo showcasing the guitar’s tonal colors and takes its name from the large, vibrantly colored sea slugs used in neurological studies of the brain. “39” is a tricky piece named for its 39 beat cycle of 7+11+7+11+3. The plaintive “Yugen,” referencing the Japanese esthetic of solitude and mystery, is based on a twelve tone row with guitar doubling Martha Cluver’s affecting vocals. The aggressive “Tredecadrome” features distorted guitar and rocking rhythm over a pattern of 13 beats in a palindrome, creating 5 bars of 13 beats in form of 3s and 2s, a total of 65 eighth notes. “Postlude” uses a guitar inversion of the bass line from “Tredecadrome” and stacks all the voices’ 12 tones for the huge final chord. The touching “Charlotte’s Song” is a musical setting of Charlotte’s lullaby to Wilber in E.B. White’s classic Charlotte’s Web . The vast potentialities of Ben Monder’s incredible talents are hard to define. His stimulating Hydra is an exciting glimpse into his musical world, one filled with color, nuance, energy and conceptualization.